Large corporations staged sophisticated exhibits to showcase their wares and tantalize us with what we could look forward to in the future. 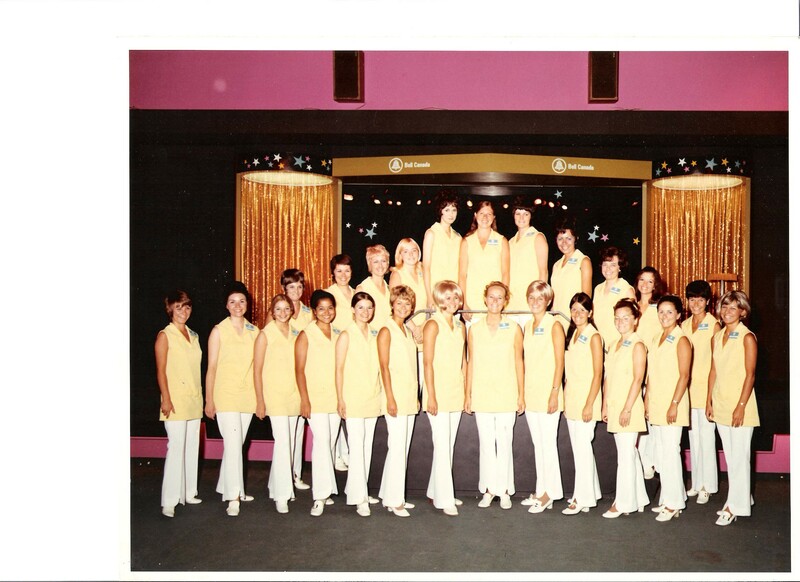 I was one of more than two dozen “Bell girls” selected from within the company to be part of that year’s Bell exhibit. It was housed in the Queen Elizabeth Building and consisted of two side-by-side “shows”. My group of girls took turns dancing “go-go-style” in a glass tube to The Age of Aquarius by Sly and The Family Stone. We wore snazzy yellow and white crimpolene pants and tunic outfits that made us sweat like pigs. When a group of people had assembled around the dancing girl in the booth (me or one of the other Bell girls), we would pick up a new Contempra phone, the latest high-tech phone of its time which acted as a microphone and delivered our little spiel. “Hello, welcome to Bell Canada . . . ” followed by a five-minute memorized monologue about all the new and wonderful things Bell was working on. We demonstrated a prototype of the futuristic “Picture-phone” which resembled a snowy black and white television screen showing a live view of whoever you were talking to. That demonstration was met with a great deal of 1969 skepticism about “what if you’re in your pyjamas and you don’t want anyone to see you”. Little did we know what 2013 would bring in terms of iPhones, Skype and the other high-tech snooping devices we use on a daily basis today. The charming “Bell Girls” of 1968. I’m the blonde with short hair, eighth head from the left. The other half of our Bell exhibit was a magic show put on by part of our contingent on an adjoining stage with seating for an audience of about 100 people. We worked in shifts and kept CNE visitors entertained and informed for the duration of the “Ex”. It was especially enjoyable for me because, not only was it an honour to be selected but I lived in a tiny apartment on Spencer Avenue near the exhibition grounds so I could walk to work. And I got to eat Ex junk food for my meal break every day. I still clearly remember the wonderful smell of frying onions as I walked along the midway to my lunch-spot-de-jour. Bell offered to sell us our outfits at cost after the EX closed but after two weeks of sweating in it and washing and wearing it every day, I’d had enough. Still, it was an experience I treasure and will never forget. Next PostThose were the days, my friend . . .